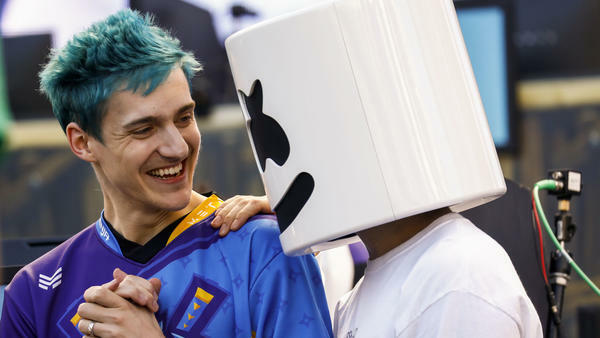 Tyler Blevins, known as Ninja, left, and DJ Marshmello, after winning the Epic Games Inc. Fortnite: Battle Royale Celebrity Pro-Am on Tuesday, June 12, 2018. By now, you've no doubt seen Fortnite mentioned somewhere (or everywhere). If you've somehow maintained a peaceful distance from it, the video game is a free-to-play online video game that's become wildly successful as a spectator sport. In it, 100 players are dropped onto a static map with nothing but a pickaxe, which is used to gather materials, like wood from trees, which are then repurposed to construct defenses. At the same time, players collect weapons from the map and — remember, this is a video game — try to kill each other in a bloodless, cartoonish fashion. In the nine months since it was released, Fortnite has drawn in 125 million users, and become a financial bonanza for its best-known players. Ninja, perhaps the game's best-known player, claims to make $500,000 a month through monetized streams of his playing on both YouTube — where he has drawn 10 million followers, including Drake — and the game-streaming portal Twitch. On Tuesday, Fortnite had its first large-scale tournament event, billed as the "Fortnite Pro-Am" and thrown by its owner, Epic Games. In the grand tradition of pro-ams, the competition paired professional players with celebrities and semi-celebrities; well-known artists like the kitsch-pop-dance producer and DJ Marshmello, Pete Wentz of Fall Out Boy and the rappers Vince Staples, PartyNextDoor and Lil Yachty. The tournament's top prize — a $1 million donation to the winners' charities of choice — was taken by Ninja and Marshmello. (For the truly curious, you can watch the entire three-and-a-half-hour battle royale here.) Another $2 million in money for charity was split between the rest of the top 10 teams. The rise in popularity of e-sports — the name given for watching people play video games — has been precipitous, with brand buy-in estimated to double from its current level to $1 billion by 2020.